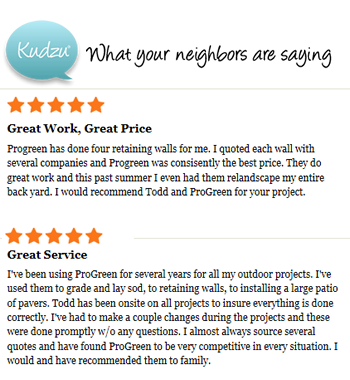 One of the benefits to working with ProGreen is our employees. We believe that our clients deserve the best and our staff is committed to providing it. With over 100 "combined" years of experience our expert staff is dedicated to providing the best solutions to landscape and hardscape issues and creative ideas for improving your outdoor living experience. Employing approximately twenty-five full time staff members, ProGreen is split between installation and maintenance divisions. Our installation staff is unique in that it began as a group of individuals with various talents and expertise in area such as landscape layout and design, grading and drainage, hardscape, irrigation, and lighting. It has evolved into a team of multi skilled players that have experience in meeting your needs in all aspects of outdoor living. Zachary Spratlin, Mike Davis, Anthony Maldonado and Jorge Chavez work with our clients onsite everyday to manage each project from start to finish. Our managers and labor force are involved in regular training and continued education to provide you with the latest products and techniques. Our maintenance team is lead by long time employee Jaime Nolasco , one of the most experienced and professional operators in the industry. Crew leaders Brent Dorsey, Dontrell Cotton, and Marlen Thomas are dedicated to building a trusting relationship with each and every client by providing quality service and communication. This has allowed ProGreen to retain customers year after year and continue to grow from their referrals.